My friend Tim Miles (I’ve never met him but still consider him a friend!) wrote a blog a few weeks ago challenging us to do something creative and unforgettable on Leap Day. It sort of bugged me because I have been in the deficit in terms of emotional energy the past month or so, feeling incapable of coming up with anything creative besides a dinner plan each night. But I at least TRIED to brainstorm. I thought about the crazy idea of wisking Eric away today by bullet train, going down to Tokyo for lunch, and coming back before the kids came back from school, but – nay, not likely. I wasn’t sure we were ready for a $400 lunch…Strike one! So my back up plan was to call the nicest restaurant in town with the torches lit out front to get reservations for lunch. We’ve been wanting to go for a year – leap day would be perfect! Alas, they are no longer serving lunch. Strike two! So, instead, we had a fun lunch at a cow tongue restaurant (yes, you read it right – it truly is one of our favorites), and then got 30 minute massages. 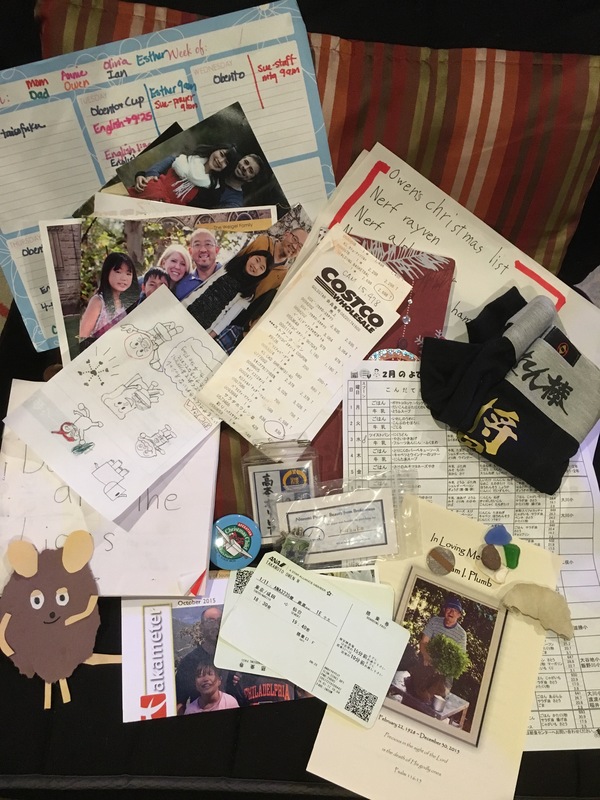 I was ok with this not-super-creative Leap Day date because of the idea I had come up with the day before — to create a family Leap Year Time Capsule! This would satisfy my creative inklings and maybe, just maybe, be ok for Tim Miles too. So tonight at dinner we talked about it. I have to say – it took awhile to get everyone enthused. As our friend Jeweliann said, who was eating with us – it’s a lot funner when you get to OPEN the box, than when you are first making it. But eventually everyone was IN. We also typed out a list of answers to questions like: What music are we listening to this year? Whats been our favorite tv shows/movies? highlights of the past year? saddest thing of the last year? closest friends right now? favorite foods? (they inevitably bring up the peanut butter noodle stir-fry dish I made TWO years ago, ONCE, that goes down as worst meal EVER, so we had to create the worse food category, even though, let me say again, it was TWO years ago! ); predictions of what they will want to be doing or good at in four years; what we’ve been learning from/about God; who of our single friends will be married; what pets we will have. We had some silly answers, and some more serious ones. When the ground dries up from today’s rain, we are planning to bury our time capsule in our yard, with everything double ziploced inside a tin can. In four years, we will dig it out, read it, and add to it… and hope it’s a ritual that continues for many leap days to come. We’ve decided that if we move, we will take our capsule with us and bury it in our new location… Hopefully we won’t forget where we buried it. Have you ever done a time capsule? Before we bury ours, are there any other items you suggest we include? Happy Leap Day, everyone. Touhoku, here we come... again!